We've created a brand new Nano polymer-based spray on wheel sealant which contains waxes and brake dust inhibitors designed to seal in your clean wheels and protect from the attack of brake dust and consequent pitting. Wheels treated with Race Glaze Nano Wheel Sealant will be much much easier to clean, look shinier longer and not need refurbishment either. The product is entirely non-hazardous so safe for us to ship worldwide. It is a clear liquid and adds shine too. 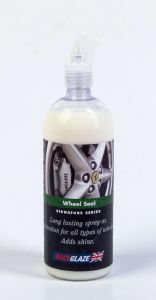 It will save you time, money and backache - a simple wash with shampoo and a sponge will keep your wheels clean for about 3 months, longer for rarely used garaged cars or weekend cars. Layering the product creates greater durability as the cross-linking polymers bond to form a tougher coating.